Zombiepalooza Giveaway & Fresh Meat! Morris watched from the shadowy alley as the group of zombies across the street lurched toward the apartment building’s open doorway. His weapon was hot against his back, outlined by a band of sweat that had soaked through his t-shirt. There had been no electricity for weeks, no streetlights, but because the moon was almost full, Morris could clearly differentiate the monsters from one another. The lead figure had a gaping cavity where its internal organs had once been and a single loop of intestines hanging over the waistband of its shredded pants. Behind was a smaller horror that might once have been a woman. Its outer flesh was, for the most part, missing, leaving only the kind of androgynous musculature you found pictured in an illustrated encyclopedia. The third had just one arm and leaned heavily to the side. It wore a Red Sox cap with a jagged bite taken out of the bill. The zombies converged on the entryway and crowded through, their bare feet making little noise against the ground but their flesh smacking as they rebounded off one another and the doorframe. When they disappeared from sight, Morris abandoned his position and reached a hand over his shoulder. The sword came unsheathed with a soft, satisfying chime and reflected the moonlight when Morris swung it to his side. He breathed through his mouth as he followed in the monsters’ wake, and although he was still disgusted by their pungency, he managed not to gag and give away his element of surprise. Homing in on their prey with a hawk-like precision they shouldn’t have possessed, the zombies burst into an apartment on the left, leaving splinters where a barricaded door had been. Inside, moonlight shone through a curtainless window, and Morris could see across the living room to a closed door on the other side. The sounds of movement from beyond it spurred the monsters on. Morris struck out at Mr. One Arm first, punching the tip of the sword into the back of its Sox cap and pulling it free just as quickly. The zombie jerked sideways and fell. The thing’s companions turned toward Morris, their faces slack and emotionless. Morris swung his weapon only once, angling the blade so that it took off the top of the taller zombie’s head and then lodged in the skull of the short, skinned monstrosity. He stepped on the latter’s face and used both hands to pull the sword free. There was more movement behind the door. Morris went to it and turned the knob. In the bedroom beyond, he found two young women cowering together on the floor amid cans of food and plastic water jugs. The post-apocalyptic world was hard for a man like Morris—slim pickings and all that—but if you followed the zombies long enough, they always led you to fresh meat. He grinned, hefted the sword, and stepped into the dark room. When Bruce comes home to an emptier-than-usual house after a hard day of work, he doesn’t have the energy to do much more than drop into the tub. What he doesn’t realize is that even when you think you’re completely, totally alone…you’re not. Awesome post, can’t say I saw that ending coming! Awesome Stuff Daniel! 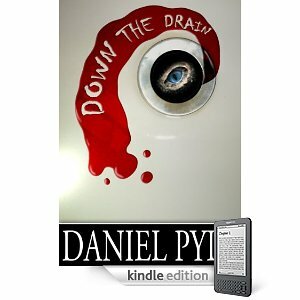 Down the Drain was great! Excellent twist, Daniel! Loved it. I’ve got Down the Drain already, but really liked this short story!